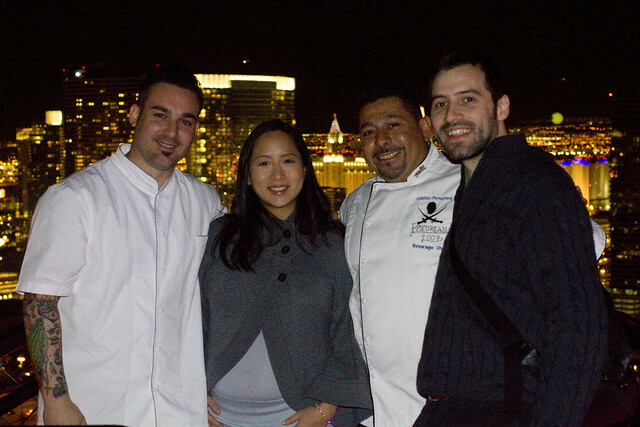 We were so honored to be invited by Harrah’s Entertainment Group to their first Las Vegas Taste Tour. Seven restaurants and one lounge was a lot to handle in just 3 days but we managed. The itinerary was put together to exclusively showcase Harrah’s propoerties so while we did not chose where to go, we still give an honest review of each place we visited. Here’s a recap of the places you should put your money on and the ones to bet against! Of course there’s also in between, like when you’re playing slots while waiting for that friend in the bathroom. At Kerry”s Gourmet Burgers 3475 Las Vegas Boulevard South, Las Vegas, NV 89109, known as KGB, the burgers are big, cooked as asked (medium rare), and they use really good buns. 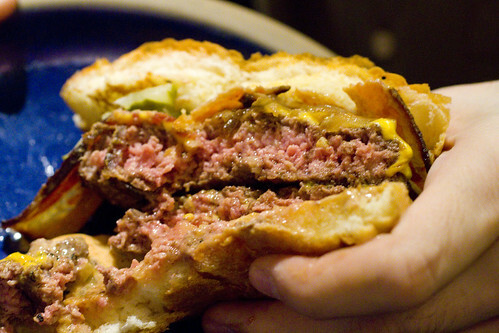 (Double Cheeseburger pictured.) Though the fries that come with are good, the sweet potato tots are the best part of the entire meal. With good prices, that’s all you really want from a burger bar. Yup, I’m trying to say, skip the rest. The appetizers, Buffalo Chicken Roll, Waffle Fry Nachos, and Mac & Cheese Stick all came out cold or room temperature. The flavors weren’t special anyway and it’s just more bar food that you don’t need. The trio of shakes (we chose chocolate malt, vanilla bean, captain crunch) was cute but not worth the extra calories. Voodoo Lounge 3700 West Flamingo Road, Las Vegas, NV 89103 has excellent 360 views of Las Vegas through the windows and the accessible rooftop. It’s worth going for that alone, but they also happen to have excellent and unique cocktails. Makes sense when the show is run by Eddie Perales, a master mixologist who represented the US in the Cocktail World Cup. 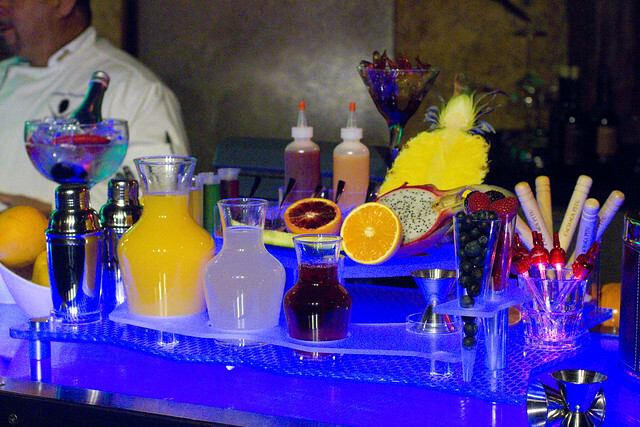 Even if you want to mix your own drinks, bottle service is not just a bottle with OJ and cranberry juice. You get this crazy set-up of mixers and fruit to really experiment. We had a little contest to invent a cocktail and we won, tied with Andrea from Foodista and Can You Stay For Dinner? We called our concoction The Ancient: roasted orange bell pepper with toasted cayenne de-glazed with fresh squeezed blood orange, a splash of lemon juice, simple syrup, muddle raspberries and tequila. 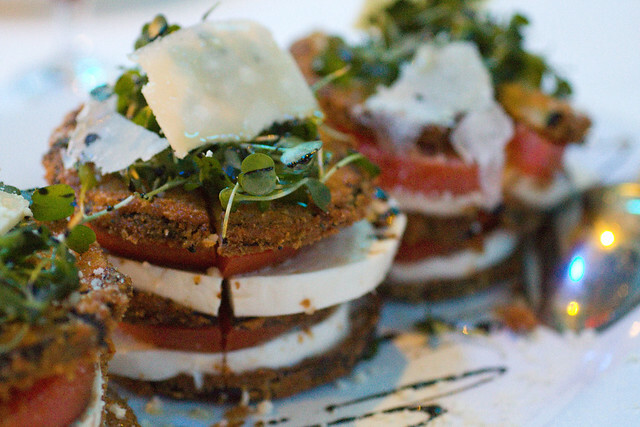 Martorano’s 3700 West Flamingo Road, Las Vegas, NV 89103 serves big family-style platters, great for sharing. The concept is like Carmine’s (for those in NY) but the food is better. 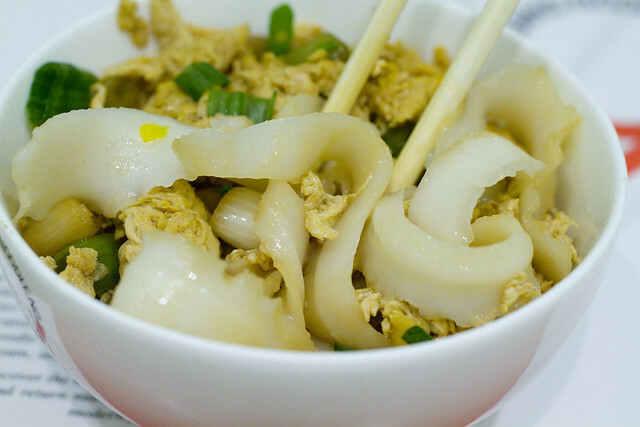 With better plating and fresher ingredients, it wins that comparison. The signature meatballs were named by Gourmet as best in the country but we didn’t find them to be that special. However, we were huge fans of the Eggplant “Short” Stack and Philly Style Calamari. Lon loved the flavor of the Lobster Francaise served with lump crab meat and risotto, but the lobster was tough. Desserts are forgettable. We used to live near the Serendipity 3 in New York and it was always packed and lines formed down the block. We could never figure it out because it really wasn’t that good. 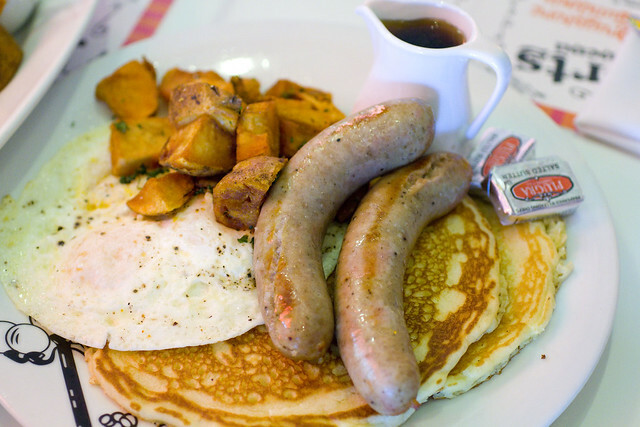 Serendipity 3 3570 Las Vegas Blvd S, Las Vegas, NV 89109 in Las Vegas is a noticeable step up. Not only is it spacious with seating indoor and out, the open kitchen is putting out plates of good food. I still think the frozen hot chocolate (also hot hot chocolate) is over-rated but I would go back for the fluffy pillows of French Toast. It comes with bacon, sunny-side up eggs, a pile of fresh berries with whipped cream, and very crispy potatoes, all of my favorite breakfast foods in a wonderful salty and sweet combo. The Hangover Omelet (with bacon, mushrooms, and french fries), Huevos Rancheros, and Sausages, Banan Stuffed Waffles are also good, but skip the chicken and waffles and Eggs Benedict. 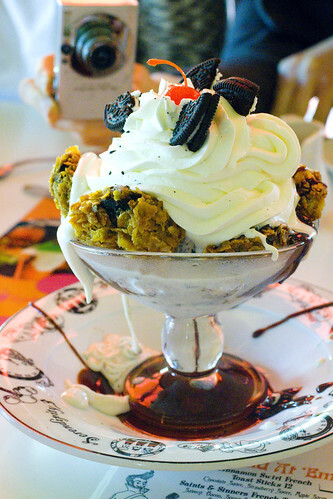 The Fried Oreo Sundae is awesome, crusted in some kind of cereal crust. Then there’s the $88 chocolate trunk painted with gold. 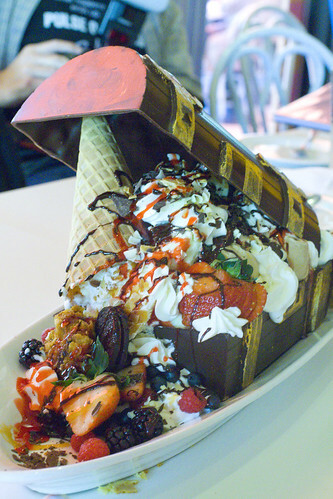 It’s filled with every dessert they have and you can’t finish it with 10 people so it’s a steal! Margaritaville 3555 Las Vegas Boulevard South, Las Vegas, NV 89109 is NOT the kind of place you’d find me, even when I’m not pregnant. Having never been before, I kept an open mind and was waiting to be pleasantly surprised. 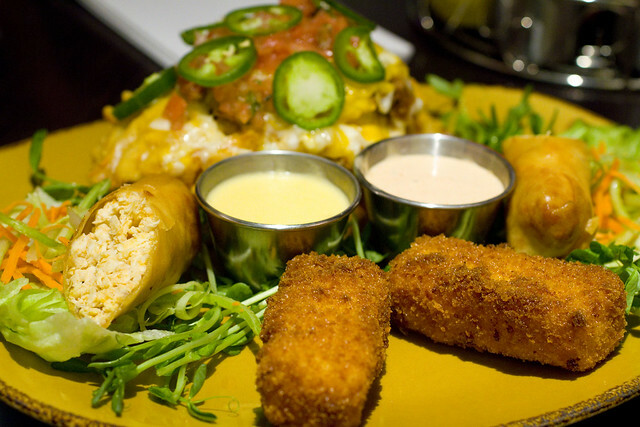 Alas, the food is giant piles of what you’d similarly find at a TGIF. 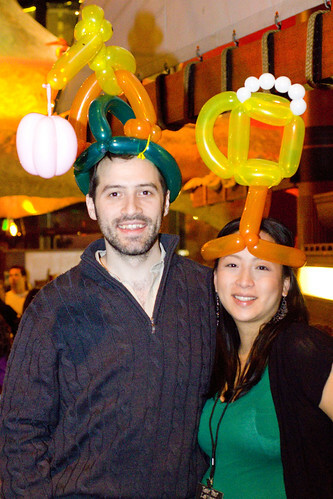 However, the balloon hat maker is the best one I’ve ever encountered, making our table a penguin, a frog, a Viking hat, a lobster, and more. I got a beer (how ironic) and Lon requested a stork. Amazing!! We’ve been to the old Payard in New York, the one on the Upper East Side that is now closed. While the desserts were beautiful and quite good, the savory food was an after-thought. Perhaps, this is why the restaurant closed. 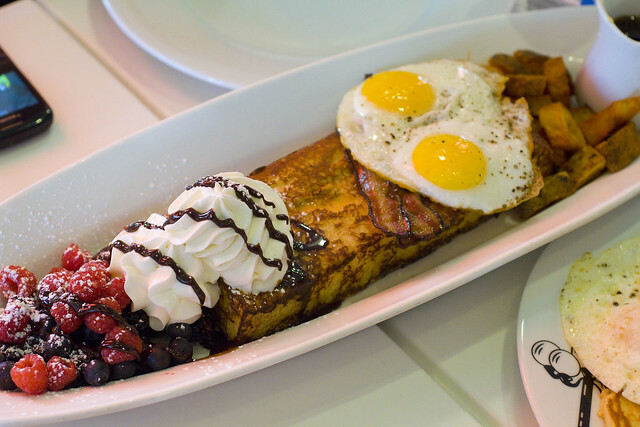 We can only speak for the breakfast/brunch at Payard 3570 Las Vegas Boulevard South, Las Vegas, NV 89109 in Vegas, but here there was more care put into the food. A Croque Monsieur and plate of Scrambled Eggs with Canadian Bacon came out fresh and hot. 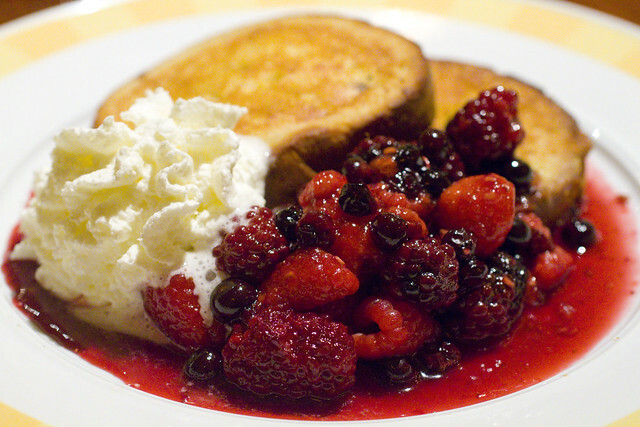 The French Toast is served with juicy warmed berries with a drop of maple syrup. A Chocolate Waffle satisfies both breakfast and dessert. More importantly, breakfast plates are about $15-$18 a plate, the same price as a breakfast plate at the diner-like space on the side of the lobby. 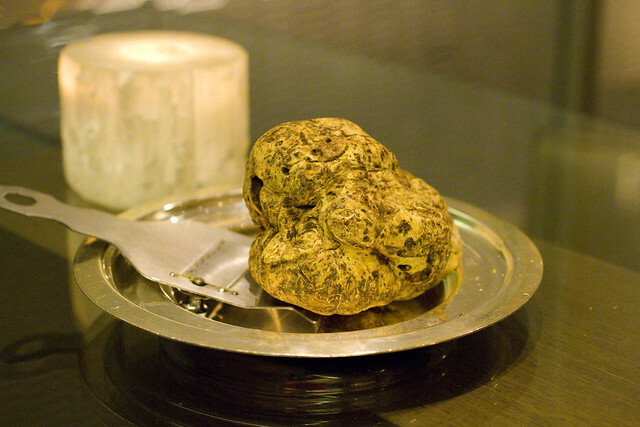 At Payard the food is much better, the ambiance way better, and the service is a step up too. Decision made. ~We noticed there’s a lot of places from New York in Vegas now: Rao’s, Payard, Serendipity 3, Mesa Grill, Il Mulino, Bouchon, etc. We went to two, Serendipity 3 and Payard, which were both much better in Vegas than they are in NY. I can’t say if the others are better, but I have a feeling they are very different so don’t count on them being the same. ~Everything in Vegas is expensive! We did some shopping around and quickly realized that you’re actually better off with name brand food here. A random slice of pizza can be $8. Ice cream from a store you’ve never heard of is $6 per scoop. None of it looks all that good either. We touched upon this in the Payard review. It has the same prices as the crappy diner-like place in the lobby. Basically, the majority of restaurants on the strip hit the same price points whether it’s the unidentifiable place or the celebrity chef off-shoot. (Prices go way down off the strip.) You might as well eat where they have a reputation to maintain. ~We had forgotten how smoky Las Vegas is and you have to walk through a casino to get anywhere. If you don’t like smoke, bring a gas mask! posted by jessica	at 09:36 AM	Filed under Cocktails and Liquor, Restaurants, Travel. You can follow any responses to this entry through the RSS 2.0 feed. Both comments and pings are currently closed.